From the inception of his career as an artist, tagging on the streets of Harlem in the 1980s, JonOne has always emphasized a painterly approach, bringing brushes instead of spray cans to tag subway trains. Drawing from the energy and freedom of painting in an urban landscape, he translates his roots as a graffiti artist to present paintings that are a completely unique form of abstract expressionism. Akin to Jackson Pollock and Willem de Kooning, JonOne’s pieces exhibit a enormous sense of movement and color. His compositions combine freestyle, hand-painted aesthetics with a sense of repetition, layering precise strokes and vibrant color for a uniquely balanced yet dynamic visual experience. Please join the artist as we celebrate the Opening Reception on Saturday, November 3rd, 7-10pm. There will be a Special Preview Thursday, November 1st from 7-9pm. 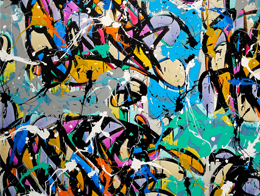 JonOne will be in Los Angeles prior to the Opening Reception. To schedule an interview or for other press inquiries please contact the gallery.